I am, however, a worshipper of all things fried and crispy. 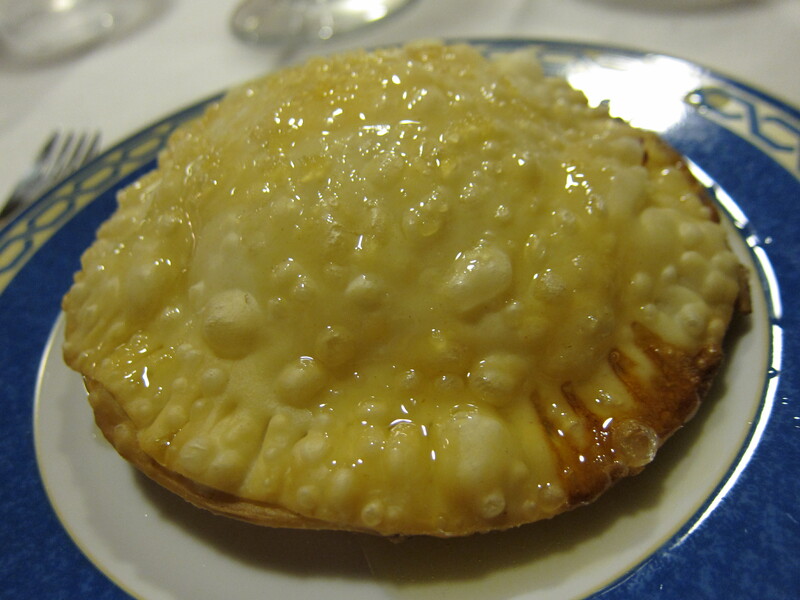 So you can understand how seadas — a traditional Sardinian dessert that’s basically a hockey puck-sized disc filled with grated young cheese and lemon peel, sealed and deep fried — would call to me. 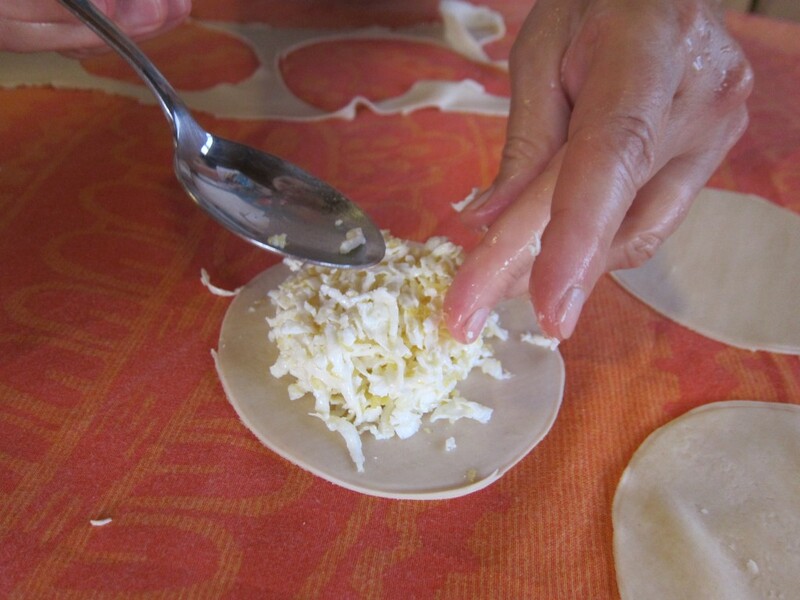 I’d had seadas before making them with Angelina — my first bite of it at a dinner with new friends in which the local insisted we try one, even though our meal had already quite properly felled us. 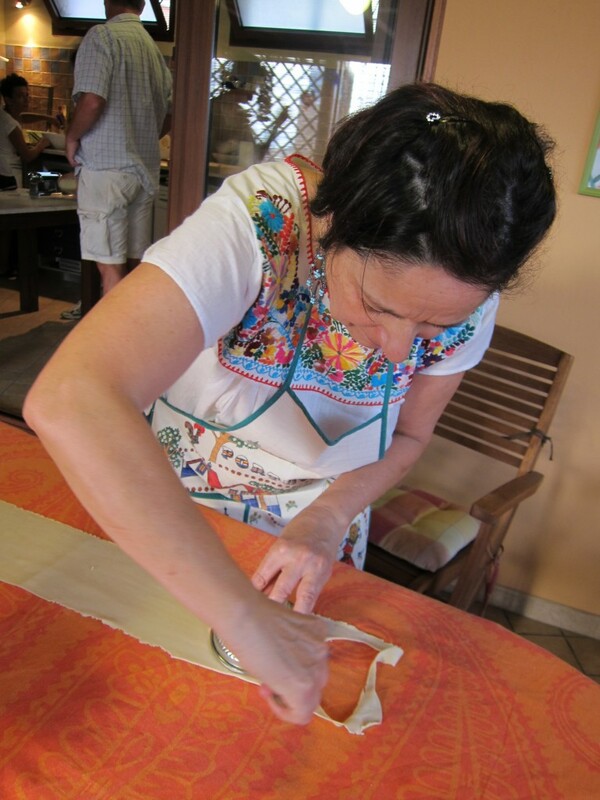 I had been hooked from that divine first taste of a seada, so I couldn’t believe my luck when Angelina started teaching me how to make them. The process is simple. First, you grate a bunch of young cheese (pecorino fresca is preferred in these parts) and lemon — make sure you don’t grate any of the white bits in, Angelina warned. 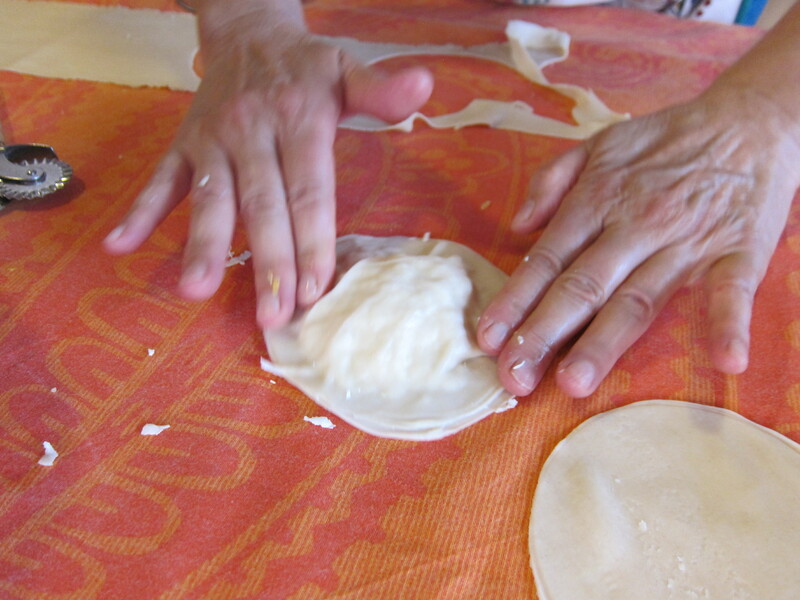 Then you quickly knead together some dough, roll that out flat and start cutting out circles. That’s Angelina showing us rubes how to do it. … and pile on as much as you can fit onto a disc. 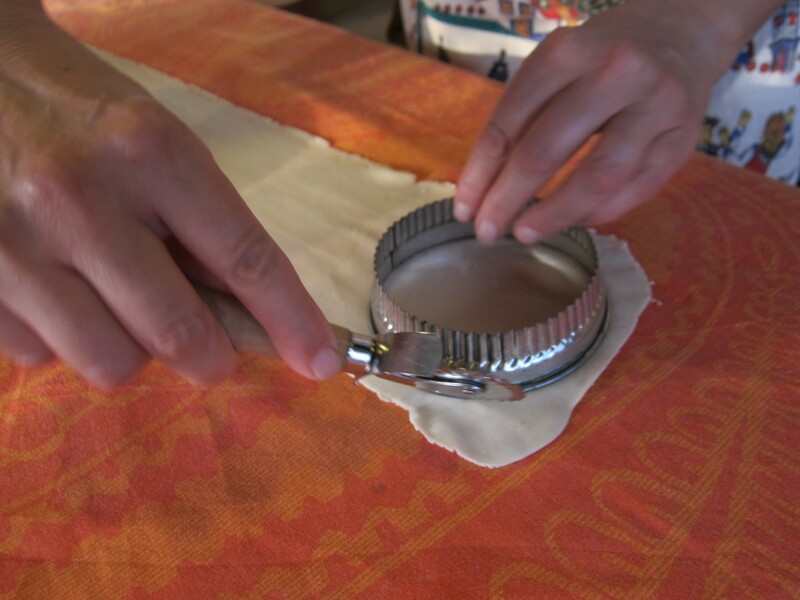 Pat everything down so it’s really compact, then layer another disc on top. 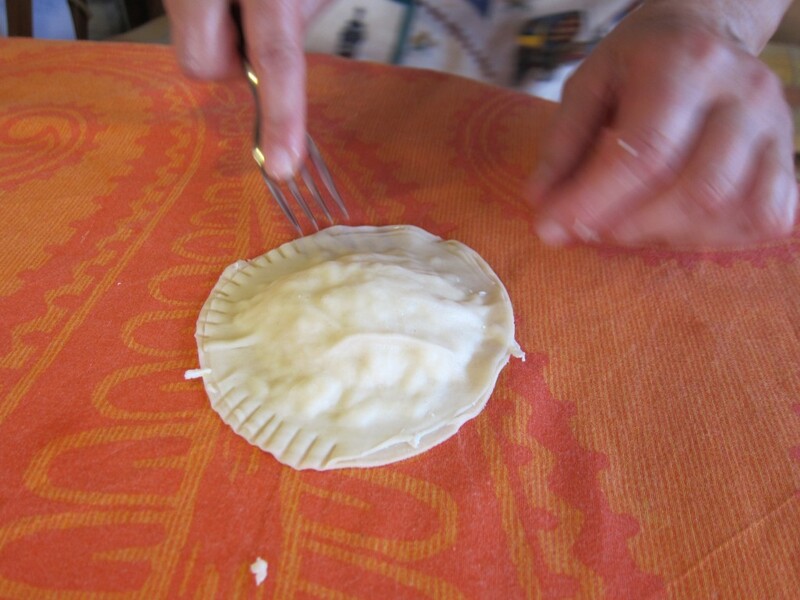 Then use the tines of a fork to seal it decoratively. 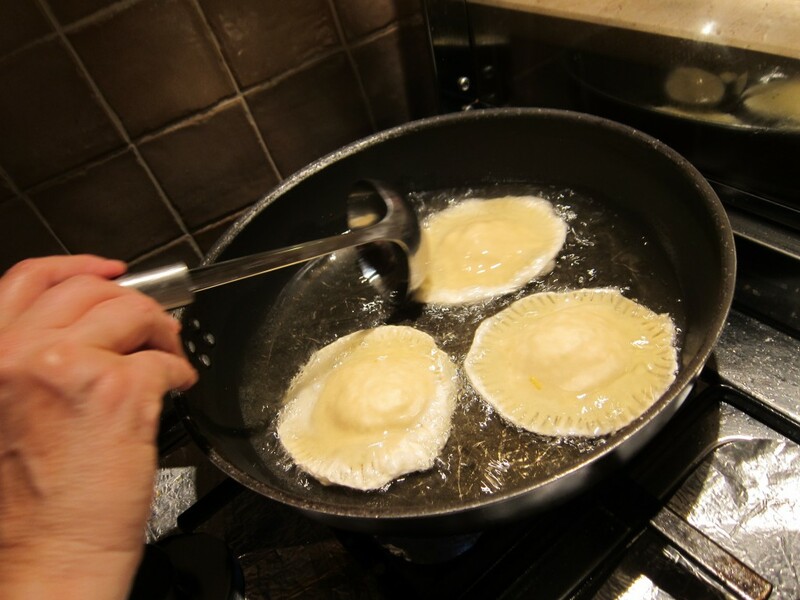 … and just slide them right in. 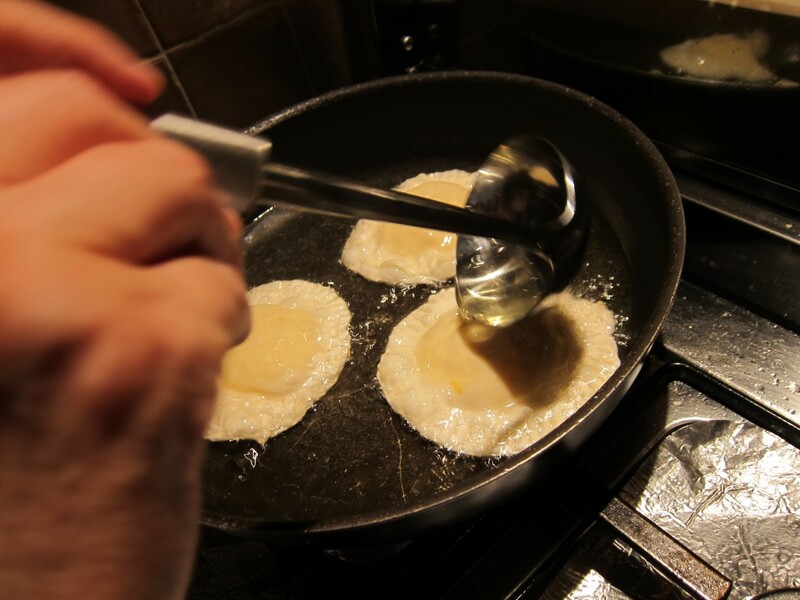 While frying, you want to make sure they get crispy on all sides so keep ladling hot oil over it as it’s frying. 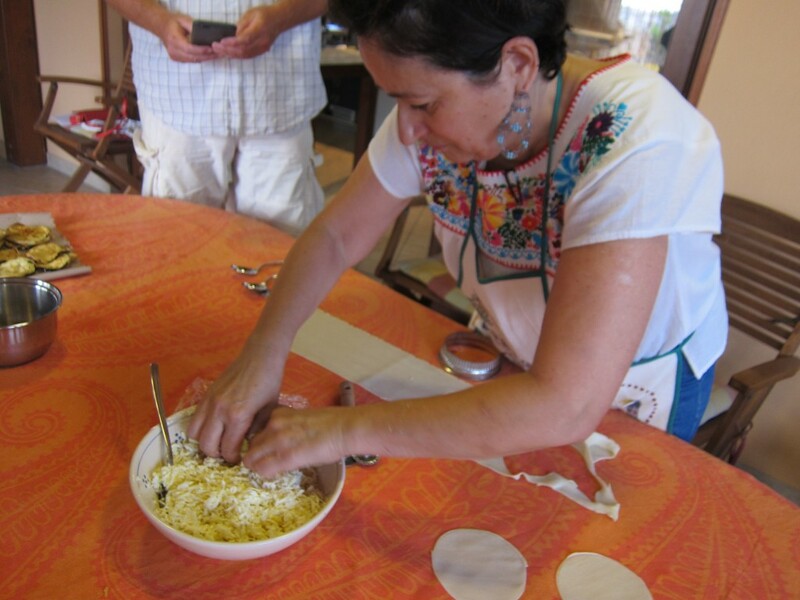 When I’d had my first bite of a seada, I didn’t think it was something I’d get to learn how to make. But now that I have, I suspect — I hope, anyway — it’ll be a dish that stays with me for a long while yet. So thanks, Angelina — and buon appetito to all! Don’t forget to check out other Let’s Lunchers’ dishes from their travels below. And if you’d like to join Let’s Lunch, go to Twitter and post a message with the hashtag #Letslunch — or, post a comment below. 1. 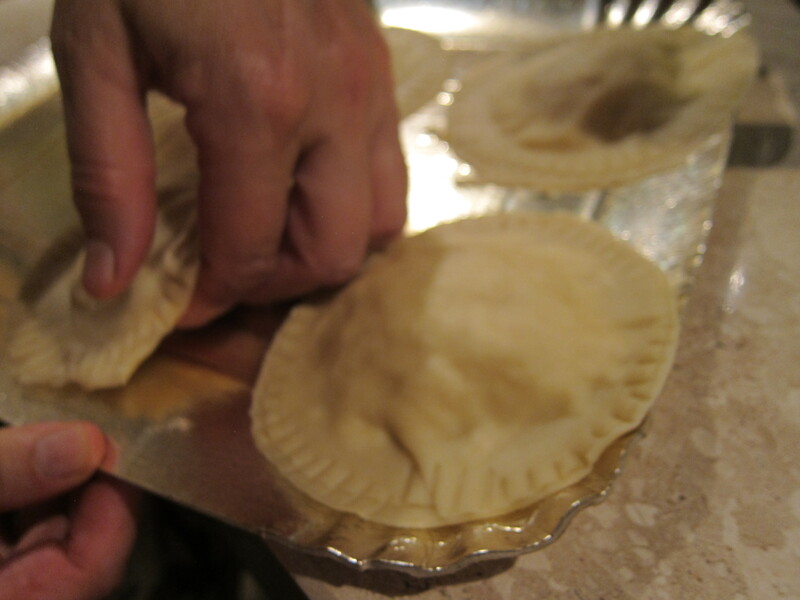 Mix the flour with the lard, salt and gradually add the warm water until it forms a dough smooth and elastic. 2. Form a ball and let it stand for half an hour. 3. 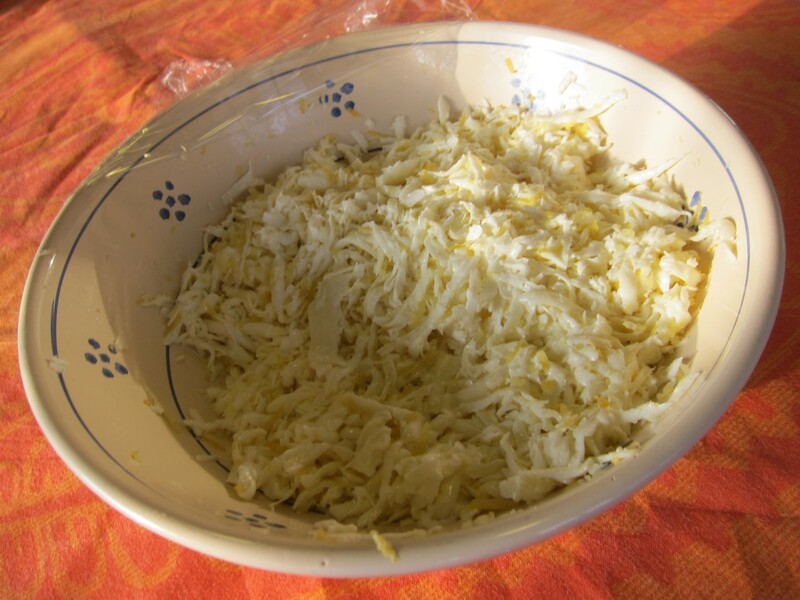 Finely chop the cheese (or grate) and add it to the grated lemon. 4. Roll out the dough thin enough and then make 12-cm disks — the lower disk must be slightly larger than the upper. 5. Put some filling on the lower disk, cover and press lightly to squeeze out air and seal the edges with the tines of a fork. 6. 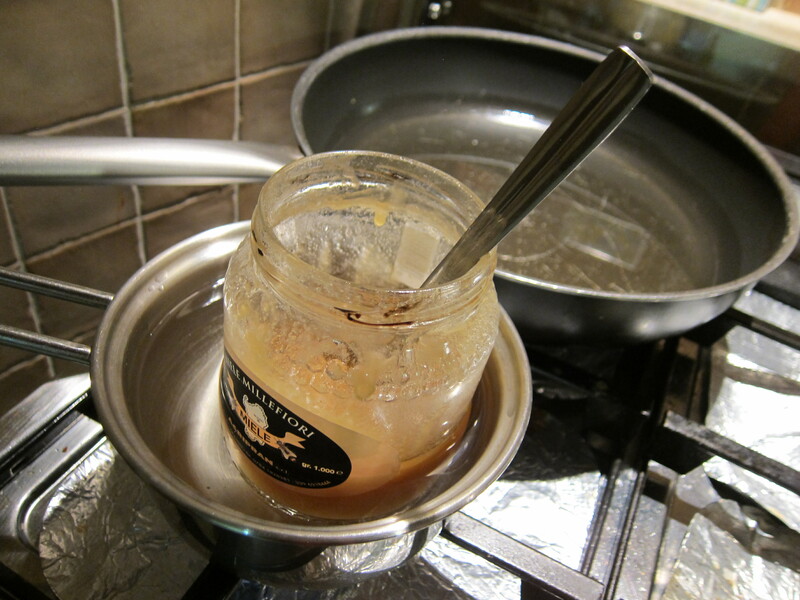 Fry in hot oil (not too hot) and pour, before serving, a bit of honey (preferably bitter like strawberry tree or orange) or sugar.